Last Saturday Murdock and I picked up our interrupted Battle of Edgehill. We were joined by Rob P. who was interested but had never fought with any historical figures (his playing background was with Games Workshop rules). So of course I gave him a command. 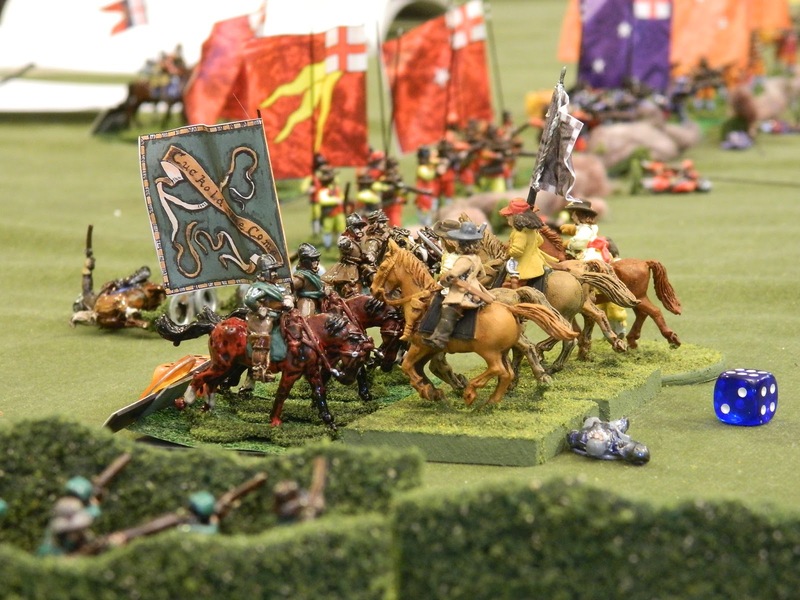 Rob P's photo of his troops charging home. Slamming home . . . and in the resulting melee his Royalist troops emerged victorious. As we fought on several units (on both sides) were eliminated during the short time we had to play . . . but never fear, we will soon continue this epic encounter. Looks a great game and I hope Rob P enjoyed his first taste of historical gaming.Perhaps you have made a new recruit? Rob seemed excited about playing, so I think he will be a new recruit. He does have some painted units because he has been primarily a "figure painter" and has been enjoying painting some historical figures including some ECW . . . and was excited to learn that he lives near us (partway between Murdock and myself). Will our schedules work out well enough in terms of getting together? That we will have to see . . . but I am hopeful. Sounds like he's off to a good start. He's in good company anyway. Always good for new people to play. Sounds like you all had fun which is important. Edgehill Win for King Charles!